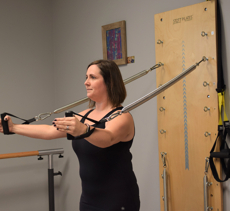 Anna Russell Before I started doing Walking Pilates with Peggy in May, I had never experienced any real success with any of the exercise programs that I had tried. They were always too difficult or too boring. But Peggy made exercising something fun and interesting and above all - DOABLE! Even in the beginning when I couldn't get some of the exercises, there was enough there that was possible to keep me going and that strengthened me to be able to do more and more. I increased my level of fitness and gained balance and strength. I can hardly wait for the fall to see what Peggy is teaching so I can do more. She is an encouraging instructor who is funny and capable. 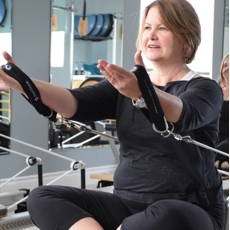 I would recommend Walking Pilates to anyone who wants an introduction to the theory of Pilates and a good workout. Thanks, Peggy! Momentum Pilates. breathe. move. live. offers Kingston Pilates classes. 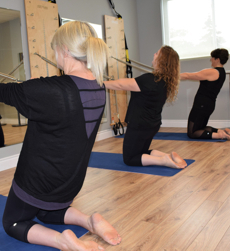 E: T: 613.546.8376 1528 Sydenham Rd Kingston, ON K7L 4V4 © Momentum Pilates. All Rights Reserved. design by webwoods.com. The information contained in this website is for general information purposes only. The information is provided by Momentum Pilates and while we endeavour to keep the information up to date and correct, we make no representations or warranties of any kind, express or implied, about the completeness, accuracy, reliability, suitability or availability with respect to the website or the information, products, services, or related graphics contained on the website for any purpose. Any reliance you place on such information is therefore strictly at your own risk.